Flexible Packaging Market size was valued at over USD 150 billion in 2015, increasing at more than 5% CAGR from 2016 to 2024. 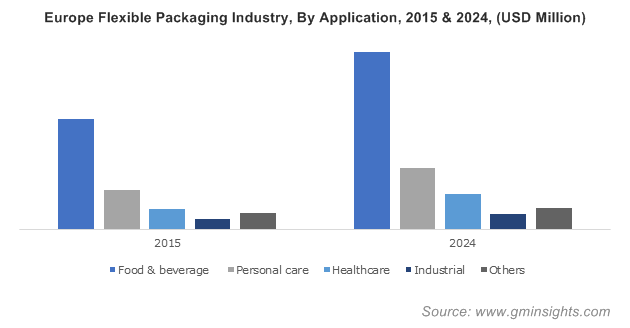 Increase in demand from healthcare, cosmetics & toiletries, food & beverages, household products, sporting goods and other agricultural products industries will drive global flexible packaging market growth. Shift in trends towards convenient packaging due to lightweight characteristic and ease of use may propel market growth. Manufacturers are moving towards flexible packaging as it creates less waste due to lower utilization of crude materials, requires less storage room along with easy transport. Global packaging spending was over USD 400 billion in 2015, flexible packaging accounted for over 20% of the industry revenue share in the same year. Barrier against moisture, appropriate sealing and heat insulation are key properties fueling industry growth. Technological advancement, improving barrier properties, developing thin elastic material along with innovations in high-speed filling equipment will drive flexible packaging market growth. Easy transportation and storage along with sustainable properties fueled the product demand. Export trading industry expansion are key factors enhancing the overall industry growth. E-commerce industry expansion particularly in China, India and Vietnam will trigger the industry growth as e-commerce emphasizes on packaging to improve the customer experience. In India above 40% of the total plastic produced are involved in packing industry. Alibaba an e-commerce company has shipped around 12 million parcels per day in 2015. Stringent government regulations regarding polymer and recyclability of packaging material may hinder the flexible packaging market growth. Increasing aluminium and polymer prices due to political unrest may impact the flexible packaging market price trend. Polymers were one of the major contributing materials, accounted for over 70% of overall industry revenue in 2015. Durability and cost effectiveness makes the product highly demanding among the users. Rising environmental concerns and stringent government regulation regarding CO2 emission may drive industry towards more eco-friendly and biodegradable materials including cellulosic and bioplastics. Innovations in shale gas, growing PE film usage and reducing PE resin cost will trigger the polyethylene flexible packaging demand. High moisture barrier, good low temperature performance, high durability as well as ability to seal without any coating are some properties influencing material penetration. HDPE, LDPE and LLDPE are majorly recognized PE products. Paper flexible packaging market was worth over USD 15 billion in 2015. The material is widely utilized in medical and pharmaceutical industries with an aim to reduce infections and contamination. Upsurge in demand from packaged and processed food as a result of changing lifestyle and eating habits has positively influenced flexible packaging market share from food and beverages application. The segment already accounted for over 50% flexible packaging market in 2015. Increasing spending on bakery and cereal goods along with rising consumer consciousness pertaining to food safety and hygiene will drive the industry growth in this segment. Digital printing technology is widely used in this industry to serve the purpose of labelling on the flexible packaging. Enhanced safety, less maintenance, efficient energy consumption and minimizing waste are some of the beneficial factors enhancing digital printing. Rising consumer demand for processed and packed food items and shifting preference for aesthetically appealing products will fuel the flexible packaging market demand. Increasing extended shelf life requirement along with preservation from contamination open new avenues for industry growth in food & beverages and healthcare sector. Healthcare application is set to witness highest gains up to 2024. Rising disposable income accompanied by regulatory support will drive the healthcare industry growth. Stand up pouches and pillow pouches are most widely used flexible packaging products. Pillow pouches will witness high gains because of their increasing usage in food & beverages and dairy industry. Low cost, high sealing ability and cost efficient transportation are some of the key properties positively influencing product penetration. High barrier properties against moisture and oxygen coupled with low material usage and cost effective properties will fuel the stand-up pouches demand. Thermally processed foods are packed in these products to extend the shelf life. Other flexible packaging products include retort pouches, four side seal pouches, blisters, lidding, and portion packs. Europe flexible packaging market, driven by Russia and Germany will witness over 3.5% CAGR up to 2024. Increasing consumer demand for cosmetics and processed food owing to the rising purchasing power will drive regional growth. U.S. flexible packaging market was worth around USD 30 billion in 2015 and is set to witness significant gains. Expansion in confectionery, diary and medical industry, technological advancement in barrier materials coupled with rising retail business, stand up pouches usage will trigger the industry growth. Asia Pacific fl generated over USD 35 billion in 2015, with over 6% CAGR by 2024. Economic development in India and China, along with food & beverages, and pharmaceuticals industry expansion are lucrative factors driving growth. Latin America flexible packaging market was valued over USD 5 billion in 2015, is set to grow at over 5% by 2024. Brazil and Argentina will be key contributing countries, increase in consumer affordability along with e-commerce industry expansion will support the business growth. Global flexible packaging market share is fragmented owing to the presence of numerous regional industry participants. Amcor Limited, Constantia Flexibles Group, Bemis Company, Sonoco Products Company and, Huhtamaki Group are the chief industry players. Mergers and acquisitions as well as product portfolio expansion were the major strategies adopted by the companies to maximize geographical coverage. Other notable companies include Wipak Group, Clondalkin Group Holdings BV, Ukrplastic, Ampac Holdings, Mondi Group and Sealed Air Corporation. Flexible package is a container when filled can readily change in shape. Development in flexible films has led healthy growth in the overall industry. It is the second largest packaging segment because of its large beneficial properties. It is widely used in confectionaries, frozen food and FMCG sectors. Polymer, paper and aluminium material serve purpose to cover & protect the products and extend shelf life. Zip locks, re-sealable seals and spouts are some of the features making the usage more convenient. The product is reusable and it also offers creativity in merchandise to make the product more lucrative, which encourages retailers. Light weight, convenience, appealing look, less wastage and easy transportation and storage are some of the properties enhancing the product acceptance.